Douneside House provides a spectacular setting to celebrate a bespoke, intimate wedding or special occasion for up to 60 guests. 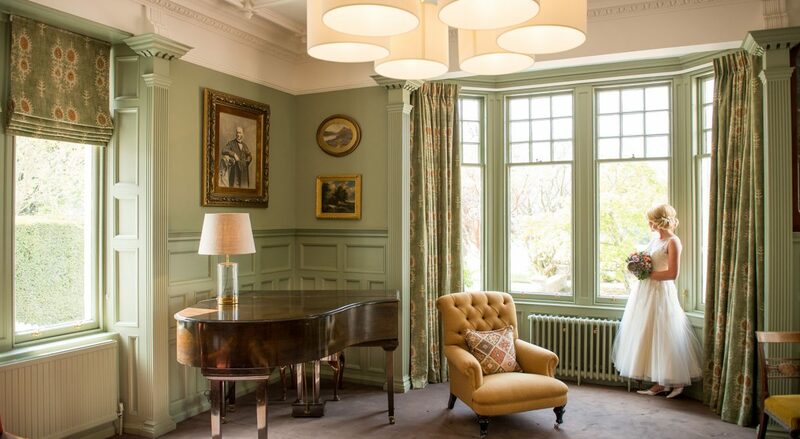 Weddings and private parties include the full use of Douneside and its grounds - from the guest rooms, Restaurant, Library, Bar and Tweed Room, to the gardens, Health Club and tennis court. Douneside House is perfect for brides-to-be in search of a romantic Scottish countryside wedding. The entire wedding party will be accommodated onsite, both at the main house and the adjacent apartments and holiday cottages. The bride has the option of getting ready and watching her guests arrive from the comfort of our bridal suite, Lady MacRobert’s room, which features spectacular views over the infinity lawn. Depending on the weather, a variety of outdoor or indoor locations can be set up for the ceremony. While the bride and groom take full advantage of Douneside House’s picturesque Aberdeenshire location with 17 acres of magnificent gardens for their wedding photos, guests may want to enjoy a game of croquet or putting on the lawn, or a warming glass of whisky by the log fire. The reception will then take place in our picturesque Conservatory, in the midst of the Terrace Garden. We offer our Library Package for couples seeking a small, initimate wedding for up to 12 guests. Enjoy the beautiful setting of our Library for the ceremony and private dining. Our weddings and events are highly personalised, with Douneside’s passionate staff assisting in planning even the smallest details. For further information, please contact us. We would be delighted to discuss your wedding requirements with you.